Last night, at a routine family dinner, we started what I thought would be a routine conversation. How was your day? My husband asked my son. Well, it was my teacher’s birthday, and some of the kids brought in cookies and cake. So you didn’t have any right? He gets up from the table and starts nervously tipping his chair back and forth, obviously irked. Was it fun? I asked. He had been talking about surprising his teacher for days; I knew he was looking forward to it. Yeah, he said. But it’s really, really, really, really annoying. That I can never have anything. I know I should be used to this. This initially surprised me, I have confidently assured family members, friends, teachers and other parents that Brett was OK with bringing his own food. Or saying, no thanks when a treat is offered. But for the next half hour, no easy task, we try to calm him of the anxiety that he’ll have to live without, and be left out, for the rest of his life. And I was up at 2 a.m. unable to get back to sleep and get this conversation out of my head. A little over a year ago, I wrote a post called Much More than a Sneeze about my son’s allergy to peanuts to show what it’s like to live with this disability. Allergy is a common condition most of us equate with stuffiness and sneezes and annoyance but nothing too harmful for the majority of people. Food allergy is often more severe, can lead to anaphalaxis, and can be life-threatening. The two conditions sharing this same name, causes confusion and misunderstanding, and often a lack of empathy or patience from people who are not familiar with the differentiation. If you read public comments from any news article on this topic, it won’t take you long to scroll down and see blatent anger directed towards people with food allergies. 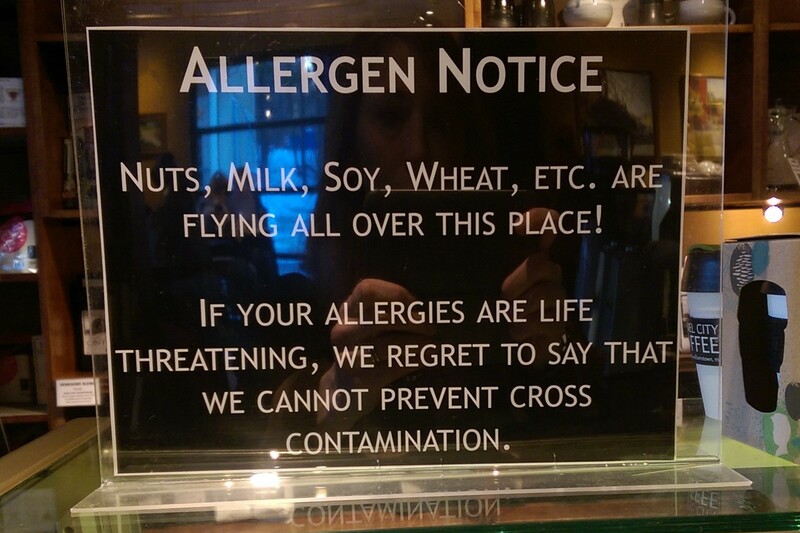 Often people assume the person is making up the food allergy. Or just wants special attention. Being overly clean. Not feeding nuts as a baby. Feeding nuts as baby. Bottle feeding. Using a dishwasher. Too many pesticides. GMOs. Fast food. Living in the city. Living in the country. Genetics. The list of who and what to blame goes on and on. Because, when most adults today were kids, they never knew anyone with a food allergy. There’s a blatant distrust that the disability, invisible to others, even exists. So why should anyone accommodate? I’m not used to it either. Pretending the repeated exclusion doesn’t bother us is what we are expected to do. But sometimes you get tired of keeping up the facade. It’s a reality that food allergies are known to lower a parent’s quality of life. So you can imagine what it’s like for the child on a day-to-day basis. But we are expecting these kids to just deal-with-it. Put on a shiny-happy-face. An age I’m told by other adults he should be more independent. Yes, he can now speak up for himself at school when those treats come out. Yes, he knows he can’t eat foods that come from other people’s kitchens. He knows how to read labels. Yes, he knows eating out at restaurants is conditional, and must include playing 20 questions with the staff on food allergy matters. But as a kid, he doesn’t want special attention; he just wants to fit in. How many times can you see you are not welcome, before it starts to bother you? At every single event where food is part of the equation. How often is food not part of the equation in daily life? Almost every day there’s a reason to celebrate something with food at school: holidays, birthday’s, seasons, graduations, finishing a big project. At camps, kids need a snack or lunch. If you are just out for the day and need to stop for lunch at an unfamiliar restaurant, food allergic people, even if reassured of their safety, are asked to assume a fry cook knows to keep their food away from the PB&J sandwich station. Ethnic foods (with peanut oil) and roasted nuts permeate the air in airports, and while on a plane, people nearby are munching on these nuts and foods at all hours, and in enclosed spaces. We wonder, will the smell and dust in the air cause him to react? If we ask the person eating nuts politely to stop, will they yell at us? We really don’t want to bother anyone, but…. These situations represent normal everyday life for most, but stakes are high for that food allergic child or adult, or parent, if they are near an allergen. As a parent, what am I supposed to say? How would any of us feel if we were told to act normal and stop worrying when in the same room as something that could cause us to stop breathing, land us in a hospital, or potentially take our life? And also, I read the news and know the reality. As kids get older, and more independent, it’s more complicated. As we let go, because “we can’t let our kids live in a bubble” more mistakes happen. 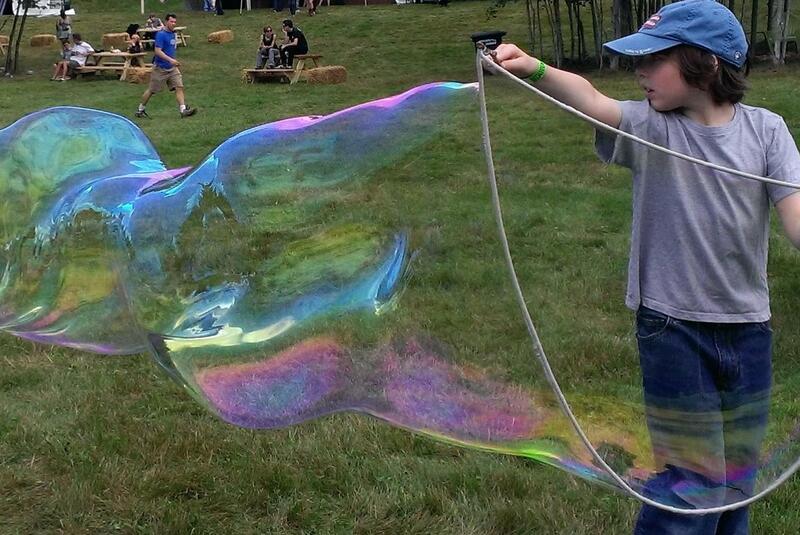 If only we could keep him in a bubble…this one looks good. And more photos of these sweet kids, who did not make it because they simply ate a cookie. Or ordered food at a restaurant they were told was safe for them, but it wasn’t, and they forgot their epi-pens, or the medication didn’t work, start floating around Facebook, and our hearts skip a beat. Unless you follow food allergy news, you may not see these headlines; there have been many, too many, in the last six months. Statements like this give me pause. If it was possible to easily get rid of this allergy don’t you think we’d be doing something about it? I’m guessing you have seen these bold headlines declaring there is now a CURE for Peanut Allergies too. Although I wish this was really true, I’ll give you my take on it. The LEAP study has received tons of press recently, with headlines proclaiming (contrary to what physicians have recommended over the last decade) peanut allergies will be cured if you feed peanuts to babies. But it’s really not so simple. The takeaway from the study is actually that physician-monitored dosing of peanut could prevent some peanut allergies from forming in at-risk babies. Note: Parents, do not try this at home! This is amazing news, if they can reverse the food allergy trend, that’s monumental. I wouldn’t wish it on anyone. But it doesn’t change anything for us. The most promising news to me is research on a patch, that uses small amounts of peanut protein to desensitize the child to the allergen. If a solution like this became available, it could minimize risk when a person with a peanut allergy is accidentally exposed to the allergen. We learned just this month research on the Viaskin patch has been fast-tracked by the FDA. But do know it’s not available today and it will be years before it’ll be a viable option for us. And there’s one more headline making the rounds: In one study, probiotics, along with other oral immunotherapies over time shows “promise” in treating peanut allergies. But this is one study. And it’s very controlled. Feeding my child gallons of yogurt, is not going to do the trick. Contrary to what the headlines promise, the game is not over. There is still no cure for Peanut Allergies. My friends and family are all pretty awesome in their willingness to listen to our food allergy struggles. I know the topic isn’t all that interesting to those who are not affected, so I try to minimize how often I bring it up. I am writing this updated post for a reason though. It’s that realization the comfort zone we have created to minimize risk over the last few years is ending, and with growth, there will be so many new challenges, it makes my head spin. Will there be a cure before he has to leave his current, food allergy aware elementary school, and if not, will this new school help keep him safe? Will there be a cure before he starts to go on school field trips? Will he ever be able to go on field trips? Or will he be left out, once again? Will there be a cure before my son starts to date, what about kissing? Will there be a cure before he goes to college, and has to live in a dorm? Will there be a cure, and not just the empty promise of a BOLD headline, EVER? Because until there is a real cure. A cure that promises us the stakes of making a food allergy mistake are no longer high. I’m hoping you’ll be patient with us. But we never, really, get used to it. Have you seen the latest headlines? Did you think this problem was solved? What challenges have you faced or conquered, growing up with a food allergy or helping to manage your child’s allergy? Or do you have tips on managing anxiety? Love to hear your thoughts!